A long time ago, there was a family that owned a small farm. The father worked very hard to make the farm successful so that he would be able to leave it to his two sons when he died. The elder son, who was married, was named Der-Shin, while the younger son, who was not married, was named Der-Yi. One day the father became very sick, and he knew that he would soon die. He gathered his sons together and said to them, “I wish to give this farm to both of you. Share it equally, and help each other to make it successful. I hope that it makes you as happy as it has made me.” With these words the father quietly passed away. The sons divided the land equally and set about the task of building their own farms. Even though they had divided the land, they still cooperated, helping each other with the more difficult chores. However, not long after the father died, Der-Shin’s wife decided that she and Der-Shin had not received enough land. After all, Der-Yi was single and didn’t need as much land as they did. So she began urging her husband to request more land from his brother. Finally, after considerable provoking from his wife, Der-Shin demanded more land from Der-Yi. Because Der-Shin was much bigger and stronger, the only think Der-Yi could do was to concede in angry silence, and let his brother occupy more land. However, Der-Shin’s wife was still not satisfied. When she saw how easy it was to get more land from her brother-in-law, she again urged her husband to demand more land. Again, Der-Yi could only consent to his brother’s demands. Still Der-Shin’s wife was not satisfied, and finally she demanded that Der-Yi leave all the land to her and her husband. Der-Yi requested help from his relatives and friends, and begged them to mediate the conflict. None would help. They knew it was unfair for Der-Yi to be forced off his land, but they were afraid because they knew of Der-Sin’s violent temper. Finally, Der-Yi decided to take a stand for what he knew was right. He decided to stay, even though his brother wanted him to leave. For this defiance, Der-Shin beat him very, very badly. Der-Yi was finally forced to leave his home and become a traveling street beggar. One day while traveling in the Jeou Lien Mountain region of Fujian province, he saw several Shaolin priests in town on an expedition to purchase food. He knew that the Shaolin monks were good in Kung Fu, and he thought that if he could learn Kung Fu he could beat Der-Shin and regain the land that was rightfully his. He decided to follow the monks, and when they reached the temple he would request that they take him as a student of Kung Fu. When they arrived at the temple he requested to see the Head Priest. The Head Priest welcomed him, and asked why he had requested the meeting. Der-Yi told the Head Priest his sad story, and asked to be taught Kung Fu so that he could regain his land. The Head Priest looked at him, pondered for a few minutes, and finally said, “Der-Yi, if you are willing to endure the painfully hard training, then you are accepted as a student here.” With deep appreciation, Der-Yi knelt down and bowed to the Head Priest. From then on, Der-Yi held the calf in his arms and jumped over the willow tree every morning and every night. Days passed, weeks passed, months passed, and years passed. The calf grew into a cow and the small willow tree grew into a big tree. 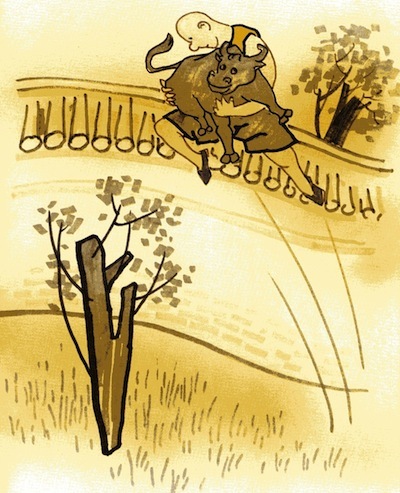 Still, Der-Yi, held the cow in his arms and jumped over the tree. Der-Yi half-believed the Head Priest, but he also thought that perhaps the Head Priest was joking with him. 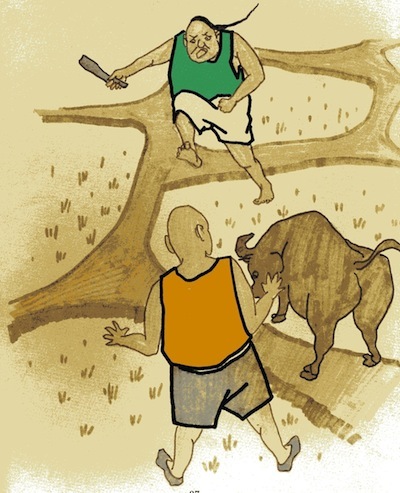 He took the cow and left the Shaolin Temple. When he arrived home, he started to cultivate his land. Der-Shin soon discovered his brother’s return. He decided to beat up his younger brother again and teach him an unforgettable lesson. After that, Der-Yi would never dare to return. When Der-Yi came to the rice field, he saw his brother running towards him, shouting in anger. When Der-Yi saw his brother running towards him, he remembered what the Head Priest had said and immediately picked up the cow and ran towards his brother. This surprised and shocked Der-Shin. He just could not believe that his brother possessed such strength. He turned around and ran away, never to return again. Friends, this story has two lessons. The first is that you need patience and endurance to succeed. Big successes always come from many little efforts. The second lesson is that the best way to win a fight is without fighting. Often you can win a fight with wisdom, and this is better than beating someone up.